is published 8 times a year in Mandarin and English by Kenter & Co Publishers’ Representatives BV. Whilst every effort is made to ensure that the information contained in this publication is correct, the publisher makes no warranty, expressed or implied, as to the nature or accuracy of such material to the extent permitted by applicable law. © 2013 Kenter & Co Publishers’ Representatives BV No part of this publication may be reproduced, stored or used in any form, or by any means, without specific prior permission from the publisher. 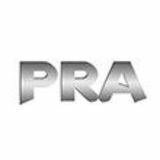 PRA is circulated free to trade readers in the plastics and rubber industry. Airmail subscriptions are available at US$160 within Asia and US$250 to all other countries outside Asia. Experience an extrusion line that will revolutionize your production. With extruders that provide excellent melt quality for all types of resin, and a concept that lets you move easily and reliably from one job to the next. in Mianyang City, China, for £38.2 million has been approved. Sichuan Forever Holding will retain a 35% equity interest in Sipo. location was specified it is expected that it will be in Lake Charles, based on Sasol’s plans to build an ethane cracker to produce ethylene on the site. •	US materials firm DuPont says it is looking at selling its Performance Chemicals segment, in line with its transformation to a higher growth. The segment includes Titanium Technologies and Chemicals & Fluoroproducts businesses, which generated total sales of US$7.2 billion in 2012. This follows DuPont’s sale of its Performance Coatings business earlier this year and the acquisition of Danisco in 2011. •	US-based supplier of rigid packaging Silgan Holdings is purchasing Portola Packaging, a manufacturer of plastic closures, for US$266 million. Portola, with sales of US$200 million in 2012, operates eight facilities in the US and Europe. and its Chinese subsidiary Demag Plastics Machinery (DPG) in Ningbo are planning to expand production capacity in China from 650 to 1,000 injection moulding machines/ year, through an investment of EUR7 million. DPG is currently producing the Systec C machine series in Ningbo with a clamping force ranging from 50-1,000 tonnes. In the future, further machine series from the Sumitomo (SHI) Demag product range will be produced in China. In addition, the firm expects to increase its exports of 25%. Besides the local market, DPG also exports the machinery to Southeast Asia, the Middle East and Latin America. The expansion of production capacity allows the company to meet the increased demand in China and other markets and pave the way for further increase in its market share, according to Stephan Greif, CEO of Demag Ningbo, who has been managing the Ningbo site since 2005. DPG has been manufacturing machines for the Chinese and other Asian markets since 1998. DPG located to a new plant in 2007, after having relocated to a larger factory premises with 11,000 m production area after achieving complete capacity utilisation. Plant/Office set ups •	US-based Eastman Chemical will increase Tritan copolyester capacity at its Kingsport facility in the US from 60,000 tonnes to 76,000 tonnes by mid-2014. •	German chemicals firm BASF is building a 100,000 tonne/ year-Ultramid nylon polymerisation plant in Shanghai, China, to start up in 2015. BASF operates other polymerisation plants in Germany, Belgium, US and Brazil. •	Ineos Oligomers has doubled the size of its Isoamlyene (IA) unit at the Ineos site in Cologne, Germany. Isoamylene is used as a raw material in a wide range of speciality markets including polymer antioxidants and hydrocarbon resins. •	Swiss speciality chemicals firm Clariant is expanding by 50% its Azo pigments and pigment preparations plants in Roha, India. Clariant is in the process of doubling its marketing and sales organisation in India, China and Indonesia throughout 2013. •	Germany-based Evonik and South African extruded plastics maker Ampaglas Plastics’s joint venture company Evonik Acrylics Africa (EAA) has opened an extrusion plant in South Africa to produce Plexiglas sheets. •	Lubrizol Additives has opened a 400,000 sq m world-class additives facility in Zhuhai, China. The plant will offer select additive component manufacturing as well as additive package blending. It also includes R&D for field testing in local vehicles under local conditions in China. •	Japanese firm Toho Tenax, a part of the Teijin Group’s carbon fibres and composites business, has set up a subsidiary in Singapore to strengthen the group’s business operations in India and the ASEAN region, where the demand for carbon fibre is expected to increase rapidly. Having absorbed the existing local office that was established in 2010 to conduct research to identify demand and provide customer services in India, Singapore, Thailand, Vietnam and Oceania, the new company will serve as Toho Tenax’s base in the region. •	US-headquartered DuPont has set up an application development centre, at the DuPont Knowledge Centre, in Hyderabad, India. It will focus on integrating advanced material science with other scientific disciplines for the automotive industry, enabling solutions for light-weighting and engine performance. The centre houses thermoplastic and elastomer processing and testing equipment and leverages existing analytic equipment shared with several DuPont science disciplines. •	Japanese injection moulding machine maker Nissei Plastic Industrial has established a Dongguan branch in Guangdong, China, to expand its sales in the country. The Dongguan branch is the second branch opened by Nissei’s overseas-affiliated company that is headquartered in Shanghai. The branch will be the fifth (second as a branch office after opening the Taicang branch) operated by Nissei Plastic. over the forecast period, according to the report. Medical polymers are used in applications such as medical devices and equipment, packaging, cardiology stents and tissue engineering. Medical devices and equipment was the most dominant application segment in 2011, accounting for nearly 50% of the global volume. Medical packaging was the second largest application segment and is expected to witness the fastest growth over the forecast period owing to substitution of conventional materials such as glass by PVC, PP and engineering thermoplastics. The report also said that fibres and resins dominated the medical polymers market, accounting for more than 85% of global consumption in 2011. PVC and PP were the highest consumed resins, accounting for more than 55% of sales in 2011. However, engineering thermoplastics, including PC and ABS, are expected to have the fastest growth, expanding at a CAGR of more than 8% from 2012-2018. Elastomers including SBC, TPU, TPO, liquid silicone rubber, and TPV, were the second largest consumed product segment for the market, with consumption over 550 kilotonnes in 2011.
foreign deliveries return to the previous year’s level. The negative rates eased steadily as the year progressed. From March to May foreign deliveries rose by 9.7%,” explained Thorsten Kühmann, the Association’s Managing Director. “The welcome upward trend in exports to Russia and the US continued, with China, India and Turkey also showing substantial rates of growth in the same period,” he added. However, based on the figures up to and including April, the Association’s recent prediction still pointed to a slight decline in sales of 1% for 2013.
rate in 2012 of more than 52% of all postconsumer PET bottles available in the region.” The association pointed out that with the exception of two members, all EU member states managed to achieve PET recycling rates above the Packaging & Packaging Waste Directive target of 22.5% for plastics. The overall European collection of PET bottles increased to 1.68 million tonnes, up by 5.6% compared to the previous year. Meanwhile, the fibres market was still the single largest endmarket for recycled PET in 2012, but the sheet and bottle market is expected to show strong growth in the future. Extrusion machines to set high standards at the K2013 While some extrusion machinery makers are keeping their new technology under wraps, waiting to showcase at the K2013, others are keen to share their new developments, which focus on efficiency and materials savings. Film, cast and sheet lines Following its launch of a low cost highly standardised dsX flex-pack extrusion coating line for the Eastern Europe and Asian markets at Chinaplas, US-based Davis Standard will show a compact in-line pre-stretch cast film line. The 2-m wide dsX stretch line enables the processing of thinner films of 6 microns, at higher speeds of 1,000 m/minute. It has a lead time of six months and is available in both five and seven-layer options. Meanwhile, Austria’s SML will showcase its modular SmartCast sheet line. The 3-m wide line in a 6-up configuration offers a choice of four preconfigured extrusion units, with outputs ranging from 1,700-2,400 kg/ hour, and in five or seven layers. SML has also upgraded the chill-roll unit by adding more functions, minimising vibration and making it easier to operate. Rounding up is the newly developed W4000-4S winder that makes machine and jumbo rolls on 3-in. cores and hand rolls on 2-in. cores. It offers both coreless and thin-core technology and has an optional edge-encapsulation system with speeds of up to 750 m/minute. US firm Welex will display its new Converge CTS Sheet Line, which uses conical twin-screw extrusion technology as opposed to the more typical parallel designs offered by other suppliers. The line is for undried PET and PLA sheet. German firm KraussMaffei Berstorff has developed a pilot/laboratory line for foamed sheet, to provide an economical line for testing new processes. It comprises a modular twin-screw ZE 40 UTXi Modular for material melting and mixing and a KE 90 single-screw extruder for melt cooling. In BOPP processing, Germany-based Brückner Maschinenbau will introduce faster lines, with upgraded machine and transverse-direction orientation (MDO/ TDO). A new MDO has automatically adjustable contact rolls for more stable production at high speeds while the TDO features a new geometry for more efficient power transmission. In BOPET film production, Brückner is also upping the ante by boosting line speeds. Web-pinning to the chill roll is optimised by a new automatic control system that allows the PET film to run at high speeds without pinningagent additives. The MDO has what is said to be a “twogap stretching”, fitted with adjustments for a closed power flow. In the TDO, a new low-vibration transport system ensures optimal stability at high speed and longer life span. Vienna-based Battenfeld-Cincinnati will display its Multi-Touch sheet roll stack. While conventional film and sheet cooling units consist of three-roll stacks, the Multi-Touch has a larger number of roll nips and achieves reliable cooling of the film on both sides. The new roll stack is equipped with a two-roll roll stack for preliminary calibration and three, five or seven rolls for final calibration. The first rolls come with a larger diameter to minimise deflection, followed by smaller rolls, thus producing film with low tension and perfect flatness, says the firm. TRENDSETTERS 5 layer polyolefin-dedicated (POD) technology was introduced by Macchi in 2001 to foster film production economies and quality enhancement by expanding the product design option. Today that break-through concept is still well alive. Together with the synergistic developments made possible by the new resins offering unprecedented possibilities of downgauging, output rates and product performances for new business opportunities across the flexible packaging value chain. German firm Reifenh채user will introduce the patentpending Mirex MT polishing stack that allows for automatic digital nip adjustment, even during production runs, without the need for manual, trial-and-error nip adjustments that require the line to be stopped. With no hydraulics, the Mirex MT is suited for clean rooms. It is available in three designs: Smart (for PS/PP processing with an output of up to 1,200 kg), Standard (output of up to 3,000 kg) and High Quality. In blown film, Reifenh채user-Kiefel Extrusion will display the Evolution Ultra Flat unit, a new film-flattening device that is installed between the haul-off nip-roll assembly and turner-bar system, where stretching and flattening can take place easily because the film is still warm. The amount of stretch can be adjusted by the heating and cooling rolls. Thus, producers are able to adapt the process to the individual requirements of the different end products and counteract sagging of the web. The result is faster and easier conversion at high speed and less waste. New dies for barrier lines Canadian supplier Macro Engineering & Technology will introduce a coextrusion die for up to 11-layer barrier films, to produce structures using PA (Nylon), EVOH, PETG and PVdC. The FlatPack die features round flow channels throughout, streamlines the flow of polymer to optimise residence time distribution and shorten residence time, compared to previous Macro dies. This reduced residence time is said to eliminate interfacial instability making the die more versatile for a wider range of film structures. The die also features shortened purging times, allowing processors to perform faster product changeovers with reduced scrap produced. The FlatPack also gives processors the added flexibility to allow major film structure adjustments by swapping layers, such as reconfiguring a A/B/C/D/E structure to A/C/D/B/E. Other features are a short height and up to 760 mm die diameter. Machinery News Also shown at Macro’s booth will be a nine-layer CenterPack coextrusion die, which Macro recently upgraded to improve processing versatility and reduce residence time. US firm Cloeren will show its patent-pending moebius-manifold die for flat film and sheet. It is available in three versions: single-layer, coextrusion and with Cloeren’s patented IDS (Internal Deckle System). A varying aspect ratio is used, with the initial larger teardrop cross-section, which is located at the centreline, transitioning to a smaller cross-section along the width to the manifold end. It is, thus, able to maintain a constant manifold length by varying the transition angle of the manifold and in turn minimises chamshell deflection. Faster speed for extruders For packaging applications, Battenfeld-Cincinnati’s latest high-speed extruder is capable of a speed up to 1,500 rpm. With a screw diameter of 75 mm and a 40 D processing length, it requires up to 25% less energy compared to a conventional extruder. It also ensures optimal melt for PS, PET, PP and EVA and reaches outputs of up to 2,000 kg/hour. Battenfeld-Cincinnati has also developed a new antiwear concept for planetary roller extruders, which are being used for applications such as calender feeding and pelletising. With the new L+ planetary spindles, uptime can be increased by up to 50%, which also leads to a reduction in steel consumption and workloads. For PET applications, Battenfeld-Cincinnati will showcase its specialised single-screw extruder with an integrated compounding section for outputs between 500-1,000 kg/hour. The firm says up to 16% of energy costs can be saved by processing un-dried PET. Meanwhile, Reifenhäuser will unveil a novel extruder line dubbed Evolution. It will feature an innovative plasticisation concept called Energizer that minimises energy and runs without barrel cooling. Melt temperature is reduced by as much as 20°C. The extruders will be available in diameters from 30-150 mm with 30:1 L/D and a new drive technology that will allow processors more flexibility to select the motor type and motor-cooling method. Pipe/profile lines For pipes, Battenfeld-Cincinnati will launch the GL (gearless) version of its solEX single-screw extruders that debuted at K2010. It features a smaller footprint (because there is no gear box) and has a new hightorque motor, said to be more energy-efficient than conventional motors. Available from 45-90 mm sizes, it also offers lower noise and vibration levels and requires virtually no maintenance. For PVC window profiles, Battenfeld-Cincinnati will show a conEX 63 P conical twin piggybacking on a twinEX 78-34P extruder that is able to run regrind. The energy-saving counter-rotating twin-screw extruders share a common control cabinet. When up to 40% recycled materials are used to process, the line can achieve an output of about 500 kg/hour. KraussMaffei Berstorff will display an enhanced version of QuickSwitch, which allows the ability to switch from one pipe size to another. It now includes the 250-450 mm diameter range and can be equipped with the company’s cost-saving internal pipe cooling (IPC) technology, where the pipe is cooled from the inside using ambient air, which is suctioned with help of a side-channel compressor. As well as reducing space and investment costs, it reduces the need for cooling water. Austrian firm Theysohn Extrusionstechnik will display its new CON 68 conical twin-screw extruder, developed specifically for duct, pressure and sewage pipes of up to 110 mm and outputs of 350 kg/hour. Theysohn will also show a three-layer PVC pipe system with a foam or regrind material core and a dual-strand line for PVC pipes of up to 3 in. Italian firm Sica will present its TRS 160 W cutting machine for PVC, PE and PP pipes, which it says can cut and chamfer without removing material, thus saving on raw material and avoiding scrap suctioning and recycling. Also, the new equipment removes chips and dust that end up partially between the saw mechanisms. Other new products are the Multibell 200M belling machine for PVC sewage pipe, enhanced to reach an output of 900 sockets/hour, and the Everbell socketing machine for processing PP pipes. In profiles, Reifenhäuser will debut the Reiwood wood-polymer composite (WPC) system, combining new profile and die-head designs, with processing costs 50% below the market. Cost reductions are achieved through a new geometry that allows 20% lower material usage. The new die-head design is also said to enable significantly higher production speeds. Meanwhile, Davis-Standard will display its compact dsX med-tube medical tubing line. Designed for clean rooms, it features language-specific control systems and faster delivery. A unique eco-extruder arrangement allows for processing materials ranging from PP to FEP by changing feedscrews. The line includes a melt pump on each extruder for processing thermoplastic polyurethane (TPU), nylons, and other medical grade material. Italian force at the K Italians will again form a large contingent at the upcoming K2013 show in Düsseldorf, Germany, taking up 26,000 sq m of space at the exhibition, which will be held from 16-23 October. Italian Machinery and Technology The machine will be displayed with a mould for an APET double eggs container. The second display from the Desmoformer series is the FT 500 simultaneous form-cut machine with lower tilting platen for moulds up to 570 x 375 mm and a 30 tonne cutting force. It is also equipped with a servomotorplugging system, stacking system with rotating plate used for the removal, count and single row stacking of the thermoformed products. Especially interesting is the tilting unit of the lower platen, which can rotate 75 degrees. The system uses a combination of servomotor-driven cams and levers and based on an innovative double desmodromic system. This ensures maximum precision and repetition of movements, as well as power calibration during both the movement and cutting phases. The thermoforming machine will show a 22-cavity mould for a PP conical container with flat edge. System for removing bottle sleeves for full recycling Machine maker Amut will promote its de-labelling (DLB) system for post-consumer PET bottle recycling that allows the recovery of PET bottles with PVC or PETG full body sleeve labels; and almost total detachment of the labels, with up to 100% recovery of bottles with full body sleeves. The labels are removed dry in a continuous process and the bottles conveyed on a conveyor belt and, after treatment, discharged continuously with a screw feeder extractor. The labels are collected in an underlying hopper and conveyed by belt to a compacting press or a container. The separation of any remaining labels from bottles can take place downstream through an air system or a “rotary ballistic screen.” DLB60 and DLB30 are suitable for treating the entire flow of bottles at the beginning of the washing line while DLB10 can be installed downstream, to treat the rejected bottles from the main NIR sorter. Software for managing blown films Industrial solutions firm Bonfanti will present a new MES software for the film sector. It can be integrated with the main cutting and scheduling applications and with the main ERP systems, for the complete management of the production tracking and labelling, product traceability, quality management and data collecting. Piovan wins at leading car maker and obtains patent At German car maker BMW’s facility, auxiliary firm Piovan supplied two Modula auto adaptive drying systems with multiple hopper assembly. Launched in the market in late 2010, the auxiliary systems supplied to BMW, automatically adjust and control all operating parameters for each individual hopper and hence use only the overall amount of energy strictly required. This is made possible through a specific control software that interfaces the settings for each hopper with the data collected by the sensors installed on the system. This means that, by using a Piovan patented airflow measuring device, located in the air supply line and at each hopper, the airflow can be adjusted and controlled instantaneously and individually, hopper by hopper. In addition, the total airflow is modulated automatically and efficiently by the central drying unit, equipped with IE3 class blowers, resulting in optimum process operating conditions. The materials utilised by BMW are mainly blends, with PP or PC base, like PP/EPDM and PC/SAN. The plastic part is first injection moulded and transferred to the painting lines, a sensitive phase of the production process where silicone particles are banned. One very important feature of Modula is the absence of silicone components/parts within the system. It will also showcase its automatic handling, storing and packing systems for metallised rolls as well as for packages and labelling systems. Electric EBM for cosmetic bottles Extrusion blow moulding (EBM) machine maker Plastiblow will exhibit the servodriven double-station PB10E/DXL. It features a 800 mm mould holder stroke, 100 mm extruder diameter, 300 kg/hour plasticising and a 24-tonne clamping force. It will be producing cosmetic bottles with six cavity moulds on each side and 120 mm centre distance. The extrusion head permits quick colour changes, said to be less than half hour using multi-cavity heads. A servodriven-three axes robot will pick up the bottles after deflashing and place them on a linear belt conveyor. The machine will also be equipped with an in-line quality control device for the bottles, to check for micro-holes, deformation and obstruction of the neck; including the detection of sprues. Unconventional solutions to traditional materials Rising costs and inconsistent availability of materials may soon be a thing of the past. Thermoplastic elastomers (TPEs) are proving to be a better alternative to plastics and rubber materials, especially since they are environmentally friendly and safe, and provide light weighting and low manufacturing costs. Meanwhile, the Asia Pacific region is dominating the global TPE market, accounting for 42.4% of the revenues in 2012, says Angelica Buan in this report. Thermoplastic Elastomers pioneering TPE solutions and the firm says tests have shown improved compatibility in the TPE matrix due to the chemical structure of the oil. GTL is the product of almost 40 years of research and technology driven by Shell. Known as Fischer-Tropsch, the technology was developed by German scientists in the 1920s and refined by Shell. GTL enables large scale production of base oils for the manufacture of premium lubricants and process oils from clean-burning natural gas. This technology has been brought to life in the GTL Pearl plant, a joint development between Qatar Petroleum and Shell, which has a capacity of 260,000 barrels/day of oil. Meanwhile, thermoplastics compounder RTP has obtained manufacturing rights from US-based ExxonMobil Chemical to produce the latter’s patented Santoprene TPV nylon bondable thermoplastic elastomer (TPE) product line. The materials will be marketed by RTP as its RTP 6091 series bondable thermoplastic elastomer compounds and will continue to use Santoprene TPV technology to provide the same property profile. Superseding plastics and rubber TPEs are pleasing both to the eye and to the touch; resistant to many different media and have different hardnesses. They adhere to thermoplastics and feature optimal sealing, damping and anti-slip properties. In addition, they are ideal for all processing methods used for conventional plastics and also a sustainable alternative to both natural and synthetic rubbers. the fact that the TPE industry is no exception in the move towards more sustainable programmes. Evolving biobased TPEs, in sectors such as food, packaging and medical, can create future market spaces for TPEs. API and hydropneumatics specialist DLM have collaborated to develop the first protective cap for quick connect couplings in 100% biodegradable material, instead of using PVC and SEBS-based compounds. The main characteristics required for this application are good resistance to UV, temperature and the weather. While in use, protective caps often fall to the ground. DLM incepted the creation of a product line with low environmental impact and the biodegradable protective caps can be completely absorbed into the ground, the company said. For API, the challenge was to create the formulation of a biodegradable material that could offer the same technical performance of traditionally used materials, while also being suitable for transformation using the machines and moulds designed for PVC and SEBS compounds. By carrying out some modifications to the rheology of the base material and by acting on the composition of the constituents, API said that it developed a special grade of APINAT Bio suitable to be worked using the equipment available. Meanwhile, PolyFerm Canada, which produces polyhydroxyalkanoates (PHA) bioplastics, says its VersaMer PHA is the only type of biodegradable TPE made from renewable resources such as sugars and vegetable oils. The semi-crystalline material is said to possess excellent elongation-at-break, water resistance and gas barrier properties, the company said. It is biocompatible for use in biomedical and tissue engineering applications. US-based biobased/compostable bioplastics maker Cereplast recently received an order from India for its Biopolyolefins 111D, which is utilised for soft grip TPE applications such as handles for bicycles and tools, cosmetics packaging, housewares, household appliances, footwear and automotive applications. French firm Arkema's Pebax Rnew biobased TPE is said to enable to bridge the gap between thermoplastics and rubbers. Compared with the other elastomers used in sports equipment, such as TPU or COPE, the polyether block amide Pebax is 20% lighter, offers greater impact resistance, higher energy return and UV resistance, and does not become rigid at low temperature, says Arkema. Asia setting the pillars for global construction Increasing urbanisation in the emerging economies in Asia is triggering growth in the building and construction industry. With an edge over population and economic growth, Asia leads the bustling construction activities, stabilising the future of the industry, reports Angelica Buan. Building and Construction Industry Indonesia leads the sector The global construction report anticipates Indonesia to build more new homes each year, slightly more than the average number for the US, and thus it will covet the third largest housing market ranking globally. Aiding the country is its Key Economic Corridor that supports the growth of key industrial sectors, with the necessary infrastructure being implemented to achieve this growth. Government initiatives are strong contributors to Indonesia’s building and construction industry growth, according to data from Timetric, a provider of online data analysis. It cites a new bill on land procurement passed in December 2011, which mandates the government to provide land and enables it to buy property at market value. Likewise, a new regulation passed in May 2012, allows foreigners to own condominiums in Indonesia, upon application for a renewable 60-year increment Building Ownership Certificate (SKBG). AECOM in its report identifies Indonesia as a strong potential growth market after China. According to its data, construction spending in the country accounted for more than a quarter of the nation’s GDP in 2012, with around half of this expenditure funding infrastructure projects. It was also noted that Jakarta, the capital of Indonesia, is the top city in the region for potential market growth and profitability. Materials shaping the industry With growth exceeding 6% annually through 2015, the global building materials market is expected to reach close to US$890 billion by this period. The most widely used building materials are steel, glass, wood, plastics and cement, according to global business information publisher MarketLine. Transparency Market Research (TMR), which forecasts a CAGR of 7% and a global market value of US$45.6 billion by 2016 for building and construction plastics, also highlights the increasing awareness of green buildings to be drivers of demand for materials in this industry. Flexible Packaging are made of glass, tins and plastic may have to give way to stand-up pouches that weigh less, use fewer resources and exhibit improved barrier properties and printability. In Freedonia’s latest analysis on the US$15.1 billion converted flexible packaging industry, it can be seen that pouches are leading with continued conversions to stand-up pouches and flat pouches. Bags will remain the largest segment and food markets will edge out non-food uses. This is affirmed by FPA that also indicates in its report the high growth rates for stand-up pouches, together with flow wraps and retort pouches. Emerging trends In a global packaging study undertaken by resealable closure company Zip-Pak, it attempted to pinpoint global consumer behaviour that consequently has shaped the packaging landscape. According to the US-headquartered firm, an ageing population has prompted for easier to open packaging formats as well as readability of packaging print. Highly mobile consumers have given rise to a culture of pre-prepared, heat and eat, and grab and go meals. In this context, packaging in portion specific sizes and formats is offered, which at the same time ensures longer product life and ease of use. The firm says that the increasing number of liquidbased brands – including coffee, wine, baby food and energy drinks – are adopting flexible packaging formats. This demand has given rise to advancements in film construction, pouch-forming equipment, and new dispensing technologies, says the Zip-Pak study team. On the other hand, over-engineered packaging that ensures theft protection and tamper-resistance much more than necessary could also “hurt” consumers (e.g., hand/finger injury during opening of package). The team suggests that a balance must be struck between content and theft protection (as considerations) in developing packaging. Blister packs in the medical segment are now designed to help consumers with medication compliance, on top of providing them with ease of use experience. Other factors that are important trend setters include employing mobile technology and QR codes onto the packaging to enhance consumer experience as well as guide them in purchasing decisions; and store-branding packaging and designs that promote convenience and freshness (such as closures integrated into a flexible packaging format). Sustainability comes into play in packaging Sustainability is directing a significant part of the demand for flexible packaging. In a recent report by Smithers Pira, the global market for sustainable packaging (both paper and plastics) is forecast to reach US$244 billion by 2018. Sustainability programmes are increasingly being seen as a source of innovation that can help in differentiating a company by appealing to the conscience of consumers. These programmes also serve as a platform for new product and market development. Injection Moulding Asia Automotive News Automotive Electronics (YFVE). Both transactions are valued at US$1.5 billion, with Visteon receiving US$1.2 billion for the portfolio of non-electronics operations. Visteon’s stake in YFVE will be valued at US$300 million. The transactions are expected to be completed in multiple stages by June 2015. The transactions support Visteon’s concentration on its core growth businesses – Halla Visteon Climate Control, of which Visteon owns 70%, and Visteon Electronics. YFV was established in 1994 between Ford and Shanghai Automotive Industrial Company (SAIC). Ford transferred the equity to Visteon in 2000 when Visteon became an independent company. SAIC transferred the equity to Hasco as part of a public listing in 2009. YFVE was formed in 1994 as a joint venture of Ford and Shanghai Auto Instrumentation and integrated into YFV in 2002.
took a stake in ACE Advanced Composite Engineering in Germany, and in 2011 established Euro Advanced Carbon Fiber Composites, also in Germany, jointly with Daimler. •	Car makers GM and Honda are collaborating to develop new alternative fuel vehicles based on hydrogen storage and fuel cell technologies. GM and Honda already have more than 1,200 fuel cell patents between them, and both companies have experimental vehicle fleets. Other vehicle makers like Ford, Daimler and Renault-Nissan have announced similar plans. The two companies are planning to develop new hydrogen storage and fuel cell technologies by 2020 and also push for more hydrogen fuelling stations. Fuel cell vehicles have electric motors that are powered by a chemical reaction between hydrogen and oxygen. The only by-products are water vapour and heat, so there’s no pollution. But the lack of infrastructure to transport and store liquid hydrogen has been a barrier to the cars’ development. Faster and more efficient In keeping with the tradition, injection moulding machine makers will showcase new technology processes at the upcoming K2013 show in Germany. The focus is on all-electric and large machines with processes for composites, LSR moulding, lightweight construction, catering to the packaging, automotive and medical sectors. Automation will round up the displays. Engel hones into efficiency ustrian firm Engel’s new 650-tonne hybrid e-speed for the packaging sector features an electric toggle clamp and screw drive and hydraulic injection, for injection speeds up to 800 mm/second and 4 second-cycle time. The new electric drive uses a patent-pending flywheel to store the braking energy from the platen movements and transfers this energy back to the motor when required to re-accelerate clamp motions. Thus, it uses less energy and lower connected loads, generates less waste heat and reduces power peaks resulting from high clamping forces applied in short cycles. Also, the encapsulated toggle with closedloop lubrication and special bushings with patented seals are said to reduce lubricant consumption by 90% and provide a clean moulding area. The machine will be moulding thinwall tubs in an 8 + 8 cavity stack mould. A brand new entrant is the Emotion 30TL, an all-electric tiebarless for the optical and electronic sectors. The firm says it has the highest precision of platen parallelism and even clamping distribution, is compact and caters up to 100 tonnes. It will develop 50 and 80 tonnemachines next year, while a 30-tonne model will be shown moulding 60-pin electronic connectors in 16 cavities. The next-generation Duo hydraulic twoplaten, available from 350-700 tonnes, features an improved clamp that runs on linear guides, is faster and has a lower nozzle centre. Also new are the ergonomic safety-gate design and the CC 300 control. The latter is designed to be operated with one hand and has a 21-in. touchscreen with both task and component-oriented navigation. Arburg goes all-electric erman firm Arburg’s focus will be on electric and large Allrounders, with ten exhibits at its stand and another ten at partner stands. The Allrounder 820A completes the electric Alldrive series and will make its premiere at the show with a newly developed 400-tonne toggle-type clamping unit and size 2100 electric injection unit. An Allrounder 370E from the Edrive series will be integrated together with a six-axis robot and an inline printing system from fpt Robotik into a production cell. An Allrounder 470A will use a 64-cavity mould from Männer to produce dosage units in a cycle time of 2 seconds. The use of cleanroom electric machines in the medical sector will be demonstrated by an Allrounder 520A, producing pipettes in a 4.5second cycle time on a 64-cavity mould from Tanner. A Vario-TIP automation system by Waldorf Technik has been specially designed for the handling of pipette tips. Injection Moulding Asia Machinery News More from Haitian, Ferromatik, Boy, Netstal, KraussMaffei and Sumitomo Demag hina-based machine maker Haitian International Holdings will roll out larger all-electric and two-platen machinery. Having shown a next generation 550-tonne Zhafir Venus 11 at Chinaplas, of which it has sold nearly 3,000 since its launch in 2009, the firm will introduce a 190 tonne machine at K show. Updates to the machine include increased tiebar distances to meet international standards for machines with clamping forces of 2,000 tonnes and more; up to eight injection units; motors in the Haitian drive systems that now provide faster acceleration rates, improved energy savings and rapid reaction times. The new injection unit is also more compact while a swiveling injection unit permits rapid replacement of the screw and easier access for maintenance. In its Jupiter II series, it will debut the 550 model with a new tiebar design, moulding engine covers on a two-cavity mould. The drive system has a direct connection between the servomotor and the gear pump, to regulate rotational speed and fast response times. It will also show a Zhafir Mercury machine running PA12 cable ties on an eight-cavity mould; the servo-hydraulic-driven Mars II eco moulding a PP transparent case in a 24-second cycle and a Venus II moulding coffee stir sticks on a 24-cavity mould and a 2.9-second cycle. Meanwhile, German compatriot Ferromatik Milacron will show an all-electric F200 with a size 50 Advanced Performance (APe) electric injection unit. Using a four-cavity mould and an IML system by H. MĂźller from Switzerland, it will produce thinwall rectangular lids with labelling, in a 3.1-second cycle. An F350 hybrid will drive a 64-cavity mould by Corvaglia (Switzerland) to produce 33 mm 2.6 g beverage closures every 4.5 seconds. Quality will be monitored by a vision system from IMD Vista (Switzerland). The third machine will be the 270-tonne all-electric F270 CUBE, boasting generous tie-bar spacing of 750 x 750 mm, an electric rotating mechanism and an 8+8 cavity cube mould with four sides, both made by Foboha. Ferromatik will also introduce a 30-tonne new machine, to round up its F series. It will produce 1.6 g applicators for 1 ml medical ampules on a four-cavity mould made by Braunform (Germany), in a cycle time of 9.1 seconds. Germany-based small machine maker Boy will introduce the 25E to replace the 22E. Also new will be the 25EVH insert moulding machine that will be equipped with a horizontal injection unit for parting line injection. Insert moulding of hexagonal pencils with a T-handle in a two-cavity mould will be demonstrated on this newcomer. Swiss machine specialist Netstal will showcase its all-electric Elion 1750-530 model producing PC infusion devices in a cycle time of 16 seconds. 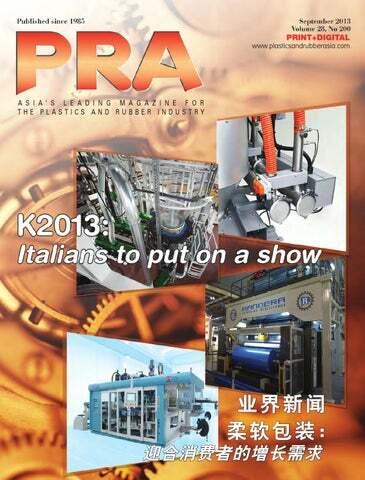 The PC material will be provided by Sabic Europe, mould by Italy-based RB/ HRS and materials handling by Italian Piovan. Besides the encapsulated joint, closed drag chains, water-cooled electric motors and clean room cladding, the machine boasts up to 70% lower energy use, with the braking energy fed back into the internal electrical circuit. Another energy saving unit to be showcased by Netstal will be the EVOS 4500 featuring the new energy-optimised Eco Powerunit drive that is already available on the Elion. Using a 12-cavity mould from Italian company Bianchi, PS drinking cups will be manufactured in a cycle time of 2.5 seconds. Automation will be provided by another Italian-based company Campetella and material handling by Motan. Injection Moulding Asia Machinery News Meanwhile, Netstal’s sister company KraussMaffei will showcase the two-platen GX series, launched on the market a year ago, in a new size of 900 tonnes. With a cycle time of 7 seconds, the machine will produce a packaging product, with the German firm saying that this is the fastest time for a two-platen. It will also demonstrate a dual platen CX300-1400 forming and back-moulding organic plates using the FiberForm composites process. Moving the MuCell foam process away from the automotive sector, the German firm will show the all-electric AX CellForm producing technical moulded parts and household goods using the process. The firm says the AX series is ideal for the process, with its high precision and shot weight consistency and also since the compensatory holding pressure phase is not required. At the show, a new space-saving metering system from MuCell provider Trexel will be used for the first time on the machine. Injection Moulding Asia Machinery News melt, where they will be homogeneously distributed. The fibre length, fibre content and material combination can also be individually adjusted. The new process allows for cost savings because plastic and fibreglass rovings are cheaper than finished long glass fibre granulates, says Arburg. A further highlight from Arburg will be the fully-electric cube-mould application for the production of container closures, to be presented jointly with Foboha. On the 320tonne electric two-component Allrounder 720A, the large size 800 injection and small size 400 injection units will be arranged horizontally, on the moving mounting platen of the machine, with both rotation of the cube and the linear sliding motion of the 12+12-cavity driven electrically. This results in advantages in terms of precision and cycle time. Further, together with partner Rico, thermoplastic and liquid silicone (LSR) suction cups, such as those used for moving bulky or heavy loads in logistics, will be produced on a hydraulic Allrounder 570S with two injection units in an L-arrangement. A metal threaded bushing will be inserted by a Multilift V robotic system and overmoulded with the two components. Meanwhile, Engel will show a new method of multi-component, soft-touch moulding of dashboards for Hyundai Kia, utilising the new Varysoft process developed by Georg Kaufmann Formenbau. A decorative, grained TPO film is preheated and preformed in one station of the automated cell while the ABS/PC substrate is moulded in Trexel’s MuCell process. The TPO film is then transferred to the mould on a rotating table, PU foam is injected between the film and substrate, using Germany-based Hennecke’s system. In the medical sector, Engel will demonstrate three-material (ABS, TPE and PP) plus insert moulding of a drip chamber for blood transfusions. The process uses a cleanroom E-victory 310 combi tiebarless hybrid with three electric injection units and servo-hydraulic ecodrive. Another automotive composites display will feature the new V-duo 700-tonne vertical two-platen hydraulic machine with ecodrive. It will produce latch covers for the KTM X-Bow GT sports car using a carbon-fibre skin and glass fibre core. The HP (high-pressure) RTM liquid reactive moulding process will use a new “snap-cure” PU resin from BASF and a Hennecke metering system. A third composite display will showcase cases for mobile electronic devices, with preformed carbon-fibre organic sheets to be overmoulded with PC/ABS on a new 170-tonne E-mac. Roctool variothermal (hot/cold cycling) moulds will be used to preform the sheets. The automated cell will also demonstrate in-line vacuum metallisation of parts for EMI shielding. Meanwhile, Engel’s 110-tonne E-motion T machine will produce acrylic automotive headlamp lenses using a three-layer process. The 30 mm-thick part will be moulded in two steps, with the core moulded/demoulded while the centre is still molten. After cooling outside the mould, it will be returned to the mould and overmoulded with thinner layers of the same material on both sides. The result is a 440-second cycle instead of 1,550 seconds for a single-layer moulding. Automation rounds up processes or the automation segment, Arburg will jointly present with its partner fpt Robotik an Agilus six-axis robot system from Kuka, with integrated Selogica user interface. The system is suspended from a linear axis arranged transversely to the machine. The combination of the six-axes with a linear axis permits more dynamic movements and faster entry into the mould. Furthermore, the small robot can move on the axis and the floor space below can be used without restriction, allowing the robot to perform a wide variety of moulded part production tasks. It is designed for load weights between 6-10 kg. Engel will show the Viper 120, its newest and largest linear robot. It has a payload of 120 kg, a demoulding stroke of 3,000 mm and reach of 3,550 mm. French robot maker Sepro Robotique will showcase 23 robots, with another six on booths of partner companies. These include two sixaxis articulating-arm robots that will operate together with three five-axis Cartesian robots. The five-axis 5X line is based on Sepro’s threeaxis beam robot and a two-axis Stäubli servo wrist. The 6X Visualline of robots combines a Stäubli six-axis articulating robot with a Sepro Visual 3 controller. Sepro will also premiere its Multi-Inject 20 robot that will operate on a multi-material, in-mould labelling application on a 210-tonne Sumitomo Demag machine, moulding ice scrapers with a soft-touch grip. Other Sepro robots will run on the Haitian, Romi Sandretto, Billion and JSW Windsor booths. Industry News its Tecnoflon FKM product range used in the rubber industry. The market segments covered include automotive, aerospace, energy and oil & gas. •	In the US, Cooper Standard has acquired the automotive sealing business of Michigan-based Jyco Sealing Technologies, which has facilities in Canada, Mexico and China. Jyco is a pioneer in thermoplastic vulcanisate (TPV) sealing technology and has supplied sealing systems and components to the automotive industry. •	Italy-based Versalis (Eni) has entered into an agreement with US firm Neville Venture for the production of hydrocarbon resins at its Priolo plant and also entered into a licence agreement related to the feedstock that will feed the resin facilities. The new resins will be used in speciality applications such as adhesives, inks, coatings and rubber. Neville is a joint venture between US-based companies Neville Chemical, a synthetic resins manufacturer, and engineering and technology company GTC. •	Citing competition from China, US-based Carlisle is looking at exiting its tyre business founded nearly 100 years ago, describing it as “no longer a strategic asset.” The speciality tyres are used on all-terrain vehicles and boat and horse trailers, but not on vehicles. It had a loss of US$86.8 million before interest and income taxes, last quarter. In Thailand, there is a similar upward trend, with car density in the country currently three times higher than the ASEAN average of 44 cars per 100 persons. This capacity is expected to increase by a third, reaching 4 million vehicles in the next few years. * This growth rate has further been fuelled by the ‘eco-car project’ that was launched in early 2007, by the Thai government. Business Unit, outlines the sector in the ASEAN, Thailand’s eco-car programme and tyre labelling. Rubber Journal Asia Tyre Industry “green tyres” – low-rolling resistant tyres contributing to fuel efficiency – could add great value to sustainable mobility. Tyre labelling shaping the Green Tyres phenomenon ccording to a research done by Germany’s Technical University of Munich, tyres on passenger vehicles have a significant impact on fuel consumption and the environment. Tyres account for every fourth filling of petrol in cars and every third filling in commercial trucks, and fuel consumption is impacted by the rolling resistance of one’s tyres used. Energy loss in tyres is caused by the heating and deformation of tyres, as they work hard to brake and grip the road. Specially engineered “green tyres” can offer consumers increased durability and enhanced safety with less rolling resistance and help improve fuel consumption with reduced energy loss. It is estimated that 20-30% of fuel consumption and rolling resistance is produced by tyres, and about approximately 24% of a vehicle’s CO2 emissions output is related to tyres. emissions. Hence, the relevant information is adequately presented on the tyre label to show consumers the economic and ecological benefits of their tyre choice. In other words, the European consumer is now made more aware of how “green” and efficient their tyres are. With tyre labelling, the power is now in the consumers’ hands to make informed purchasing decisions to save fuel and money. With the success of the EU’s tyre labelling legislation, many countries have already followed suit in hopes of shrinking domestic fuel consumption, cutting down CO2 emissions and also raising the standards for tyre safety. In the Asia Pacific region, there is already action taken by countries to go the same direction. As of December 2012, South Korea legislated tyre labelling with the aim of reducing their CO2 emissions by 30% by 2020. Japan has also initiated the tyre labelling initiative on a voluntary basis since 2010, and this has been championed by the Japan Automobile Tire Manufacturers Association (JATMA), an independent conglomerate formed by Japanese tyre makers. In the case of Europe and Korea, where tyre labelling legislation is in effect, the display of such labels are now mandatory at the point of sale. In Japan, due to its voluntary approach by tyre manufacturers, consumers will only see such labels on tyres of participating tyre makers. Rubber Journal Asia Tyre Industry While the above markets have detailed tyre labelling in place, China, the biggest automotive consumer in Asia, has vocalised its aim to reduce its CO2 emissions by 40-45% by 2015 via tyre labelling in the near term. At least 25% of the tyre manufacturers in China have been tasked to produce fuel-efficient and low carbon emitting “green tyres” by this coming mid-decade. India has also publicly announced that it is seeking to reduce the country’s CO2 emissions by 20-25% by 2020, and perhaps it is a matter of time when other countries with overcrowded cities and traffic woes in ASEAN follow suit. essential in Thailand’s bid to stay competitive in the global market while meeting consumer demand for environmentally friendly goods. It will be then imperative for Thailand not to fall behind on technology and instead stay on course with consumer and industry trends and developments, i.e., tyre labelling. There is no doubt that the implementation time in different regions and different countries will differ due to local political and social reasons. However, the EU example has definitely influenced other regions and countries to follow suit. A good example is Brazil. The topic of tyre labelling kick-started in the Brazilian governmental discussions shortly into the year 2010, As of mid-2012, the government has confirmed that it will follow the EU’s blueprint on tyre labelling aiming for implementation before 2015 – approximately about half the time the EU had taken to get it legislated. Based on the introduction and adoption and response to its eco-car policy, Thailand, too, is ready for a tyre labelling legislation foreseeable anytime in the next 3-5 years. This can be further propelled by the automotive industry taking the voluntary approach as seen in Japan, or the legislative route approach as taken by the EU. Will Thai legislators take the next step toward sustainable solutions to further the success of their eco-car programme? Only time will tell. With the implementation of the Japanese tyre labelling regulations, at the 2011 Tokyo Motor Show, the Japanese tyre maker released the prototype for the 100% fossil fuel-free tyre, made from epoxidised natural rubber (ENR). Since then, the firm has furthered its development to improve the product durability as well as the implementation of the technology for mass production. Also new in this tyre will be the use of “ultrapure natural rubber technology,” which is the manufacturer’s solution to increasing longevity, and therefore reducing raw materials consumption. The natural rubber is highly purified to enhance the interaction of the natural rubber and carbon black, which helps to increase tread life. The product will be released in November. Meanwhile, at the Malaysia-based International Rubber Research and Development Board’s International Rubber Conference 2013 on rubber technologies, Dr Stuart Cook, the Director of Research at the Tun Abdul Razak Research Centre (TARRC) in the UK, spoke about the development of Ekoprena ENR, which has been used by Sumitomo in its tyres. Cook said the development of the green tyre technology, which at first merely referred to the fuelsaving properties of synthetic rubber tread compounds with precipitated silica-filler and silane coupling agent replacing carbon black fillers, has grown to include sustainable, non-fossil fuel resources. More recently, with the tyre label ratings, natural rubber latex has been chemically modified, making use of ENR to reduce rolling resistance while improving wet grip. Ekoprena is one of the additions to this, and is said to reduce the impact of the tyre tread on fuel consumption by up to 30% on truck tyre radials and more modest gains in passenger tyre radials. Commercial production of Ekoprena began in Malaysia this year, with Felda Rubber Industries as the sole manufacturer. Felda expects output to increase to 300 tonnes/month this year and 1,000 tonnes/ month by 2014. Felda’s natural rubber production capacity is 280,000 tonnes/year. butadiene, and a new material using palm oil surfaces in Malaysia, Sumitomo is planning on launching a 100% sustainable tyre in November, made from Malaysia’s Ekoprena. S chemicals firm Invista and Portugal-based computational biology company SilicoLife are collaborating to develop new technologies to enable bio-derived processes for the production of industrial chemicals like butadiene. The agreement will leverage Invista’s capabilities in biotechnology and catalysis, and knowledge of the chemicals industry, and SilicoLife’s in silico (performed on computer or via computer simulation) metabolic engineering and rational synthetic biology capabilities for the development of new biobased routes to industrial chemicals. SilicoLife offers metabolic engineering solutions, builds computational models of microbial cells and develops proprietary algorithms to find the most efficient pathways between the raw material and the end-product. Meanwhile, at the upcoming Latex & Synthetic Polymer Dispersions conference to be held 10-11 September in Kuala Lumpur, a presentation by Prof Dr Khairiah Haji Badri, Head of Polymer Research Centre at the Universiti Kebangsaan Malaysia (UKM) will focus on a rubber-like polyurethane from palm kernel oil, made using a pre-polymerisation technique. Badri says the material is a palm oil-based polymer. “It combines knowledge in rubber and is added into a plastic with the utilisation of a sustainable green material (palm oil) that is found in abundance in Malaysia.” The basic reactant, the palm oil-based ester, is already in the stage of precommercialisation, she said, adding that it has been produced at a pilot plant in UKM that has a capacity of 500 kg. “Green” tyres on a roll umitomo Rubber Industries of Dunlop will display a 100% fossil fuel-free tyre, which does not use any fossil fuel resources such as petroleum, at the 43rd Tokyo Motor Show 2013 in November. The company says it has been working on the tyre since 2001 and released Enasave ES801 in 2006, which increased the usage of non-fossil resources to 70%, furthered by the release of Enasave 97 in 2008, which had 97% non-fossil resources. Building a rubber nation The increasing usage of rubber is driving demand globally and this has encouraged expansion of rubber acreage of late. The Zamboanga region, with a total planted area of 79,138 hectares (in 2011) is the country’s leading producer of NR with Zamboanga Sibugay as the major producing province. of spadework towards improving yields and implementation of modern planting/ tapping techniques, it is headed towards growth, according to Angelica Buan and Rhodora Medalla, President of the Philippine Rubber Industry Association (PRIA). n the first quarter of this year, the Philippines posted a 7.8% year-on-year economic growth, according to the National Statistical Coordination Board, and therefore has become Asia’s fastest rising economy to date. Ranked as the 40th largest economy by the International Monetary Fund last year, the country has outpaced other ASEAN economies based on Standard & Poor’s (S&P) upgrading following a GDP forecast of 6.9% this year. Hence, the country is now ahead of Indonesia (6.1%), Vietnam (5.3%) and Malaysia, (5.3%). However, success did not happen overnight for the country that has transitioned from an agricultural economy to a service and manufacturing base. Nevertheless, its natural assets – climate and vast acreage suitable for cultivation of crops – will continue to drive revenues for its economy. The Philippines has been cultivating natural rubber (NR) for more than a century now. Back then, three major US tyre companies, Goodyear, Firestone and Goodrich, set up their manufacturing plants in the country. Each company owned 2,000 hectares of plantations in the Mindanao provinces of Zamboanga Sibugay, North Cotabato and Basilan. During the ‘80s, at the height of the US economic recession and the Gulf war, the three foreign firms closed down their plants. The rubber plantations were also broken up into parcels and allotted to small holders during the implementation of the land reform programme of the ruling administration. Rubber Journal Asia Philippines Rubber Industry Medalla suggests that to boost domestic rubber production, the plan should include “promoting new rubber plantations and replanting schemes by using tried and tested rubber tree clones adaptable to soil and weather patterns in various areas in the Philippines.” Meanwhile, the Forest Products Research and Development Institute says that opportunities exist for the country to groom the rubber industry. For instance, Malaysia’s lower NR production is a signal for the Philippines to expand its exports. Foreign companies are taking the cue, with Yokohama Tyre’s production capacity expansion from the current 21,000 to 50,000 tyres/day by 2017 will make the Philippines-based plant the largest amongst Yokohama’s tyre plants worldwide. Therefore, it is subject to international factors like fluctuating oil prices, unstable foreign currencies (US$ to Php exchange) and the financial crisis in Europe. Another factor is the lower demand from China, which is one of the major importers of our crumb rubber (rubber blocks) and cup lumps,” Medalla told PRA. Supporting the workforce hether cartels exist or not, the lower rubber price was a harsh blow to farmers and processors who now have to make do with lower incomes. “Rubber tappers in the Philippines get 30-50% of their incomes from the harvest. Depending on the agreement between plantation owners/farmers and the tappers, some are paid a fixed daily rate. But there a r e only a handful of owners who practice this,” Medalla says. Myth or truth: rubber cartels push prices down eak global prices usually result in the setting Aside from meagre incomes, many farmers and up of illegitimate rubber cartels to shore up rubber tappers lack skills and techniques to properly prices, a strategy that has seen backlashes against tap rubber trees. several European companies. On the other hand, “Many will exploit rubber trees to the maximum, what has been deemed legitimate is the regional NR especially if the market price of cup lump is high. cartel formed in 2001. The International Tripartite But this practice may, in the long run, damage the Rubber Council (ITRC) comprises the top three rubber tree’s productivity life,” says Medalla, when rubber producers, Thailand, Indonesia and Malaysia, asked about the problems facing the rubber industry’s has strategised to stabilise prices by limiting NR workforce. She adds, “Increasing the incomes of production and exports of the founding countries. farmers and processors will prevent, if not eradicate, Legitimate or not, the corruption and unlawful rubber sector is indignant on business practices.” cartelisation and farmers in Medalla explains that “…..the rubber sector is the Philippines have recently government agencies indignant on cartelisation blown the whistle on the setare putting their heads up of a likely cartel. together to counter the and farmers in the In late July, an estimated problem of skills. “The Philippines have recently 5,000 rubber farmers from Agriculture Department and the Free Tappers Association the Technical Education blown the whistle….” in North Cotabato (a Central and Skills Development Mindanao province that is the Authority (TESDA) are country’s second largest rubber producer with 55,000 working together to formulate training modules to hectares) claimed that a cartel had been pushing the certify and upgrade the skills of tappers.” cup lump prices down. The farmers said rubber was Medalla also says that the country started its first sold at Php36/kg in July, lower than the Php 50.51/ rubber training centre in North Cotabato last year. It kg price in February. According to Anthony Bravo, is operated by the local government unit (LGU), which DTI Provincial Director, the lowest buying price per provides training on proper tapping methods and kg recorded in the province was Php19.23 in December new technologies without charging any fees, with the 2008. trainees mostly absorbed by the local rubber industry Consequently, the low prices have taken a toll in the area. Trainees from other areas outside North on farmers’ earnings. However, the local authorities Cotabato are also accepted for a fee. “It focuses on debunked these allegations, with the North Cotabato rubber plantation and production and is not related government attributing it to unstable rubber prices, to the downstream manufacturing of rubber products, lack of modern processing facilities in the province and which is what PRIA represents,” says Medalla, adding a shortage of latex and coagulated lumps. that other LGUs are encouraged to replicate the PRIA also confirms that there are no rubber cartels training centre in their areas. in the Philippines. “The reason for the low prices is The centre also extends training to ethnic that being an agricultural product, rubber is a globally minorities and recently concluded a rubber tapping traded commodity just like rice, sugar, corn and wheat. training course for a group of T’boli natives. Rubber Journal Asia Philippines Rubber Industry “Skills training forms part of the human resource development programme of the government and it is being conducted to increase the number of tappers and workers in the processing sector,” Medalla explains. While rubber processing and production are mostly male-dominated, according to Medalla, women are also contributing to the sector, mostly constituting the workforce in the bud planting segment and rubber nurseries owned by corporate farmers. Overall, the Philippines, in its journey to becoming a growth leader in Asia, is still contending with high unemployment rates. Medalla believes that the rubber sector can help address the scarcity of work, especially in rural areas. “In Mindanao, as well as areas where rubber planting is amenable, there will be a need for skilled tappers and workers, therefore the quality of lives of these people will improve,” she says. The scheme is targeting to cultivate 200,000 hectares by 2016, or an average increase of 10,000 hectares/year. The DTI projected that the plantation target will create some 5,000 jobs per year, or a ratio of one job per 2 hectares. Not a sunset industry yet edalla envisions bright prospects for the local rubber industry and for it to grow at a steady pace. “The high confidence rating of the business sector in the Philippine government (under President Benigno Aquino Jr.) has created a wave of enthusiasm, optimism and faith,” she says. She adds that the country’s rubber sector has yet to tap its full potential, nevertheless, it already has taken bold steps to position itself strategically amongst its co-rubber producing ASEAN member countries. “Amongst our strengths is that we still have land to develop plantations. We can also adopt new rubber tree clones and modern agricultural technologies that have been proven effective through years of research by other NR producing countries. This can be enabled by technology transfers within the ASEAN group. Implementing these will prevent us from making costly mistakes,” she says. China’s increasing labour costs and the subsequent higher prices of finished products could also benefit manufacturers in the Philippines, says Medalla. “Customers will seek out more options and start buying Filipino products that are equally cost effective and of high quality,” she observes. As for the slowdown of global demand from the automotive sector due to the slower economies in Europe, US and China, Medalla says that the situation is short term. “The fact that transportation is a necessity is assurance that demand will pick up again in the near future.” According to Singapore-based International Rubber Study Group (IRSG) and the ANRPC, global market demand for NR was 10.974 million tonnes in 2011; and 10.9 million tonnes in 2012, versus the world market supply of 11.031 million tonnes and 11.383 million tonnes, in 2011 and 2012, respectively. Medalla says that though there was a surplus in 2011/2012, the demand, notably from the tyre industry, will be on an uptake in 2013/2014. In conclusion, Medalla adds that even though the automotive sector is the top consumer for rubber, other sectors like industrial, marine, construction, footwear and medical are potential and huge markets ready to be tapped by the Philippine rubber industry. Automobile industry of Iran ranâ&#x20AC;&#x2122;s economy is one of a few economies in the world that remained unscathed during the 20072009 recession, helped mainly by the countryâ&#x20AC;&#x2122;s oil and gas sector. In 2010, oil and gas exports from Iran constituted 60% of government revenue. The country was the fourth largest oil producer in the world in 2011 and its petrochemical segment has a high capacity. The automobile industry trails after the oil industry, with 1,648,505 cars produced in the country, making it the 13th largest maker of cars globally and the leader in the Middle East. In 2009, Iran ranked fifth, with respect to the growth rate of the global car industry, after China, Taiwan, Romania and India, with an average of 200 cars per 1,000 people. Based on the Bureau of Census estimates, Iran has a population of 77 million, with a majority aged between 15-39 years old; and a high literacy rate of the population that is educated up to tertiary level. iven the growth of the young population in Iran and the very diverse desires for car selection, the automotive industry and its related industries, particularly the tyre sector, have grown. In respect to these conditions, the tyre industry has made investments for enhancing the technical and performance aspects so that it can maintain its position in the competitive global market. Iran entered the automotive industry more than 50 years ago to manufacture different kinds of automobiles, with the first automobile factory established in the country in 1957. Thus, the first tyre factory was set up in the country by BF Goodrich about 50 years ago. As Iran is the second biggest country in the Middle East, with an area of 1,698,340 sq km and also due to the growing young population, the tyre industry should be suitably developed, alongside the car industry. Of course, it should be noted that the establishment of the Iran Polymer and Petrochemical Institute and Iran Rubber Industries Research Centre, have helped this industry to grow significantly. Rubber Journal Asia Country Focus of bias and radial tyres for cars. One of them has the technology to produce radial tyres for trucks. The tyre industry is growing in tandem with the car market and it can be noted that there are not enough tyres to supply the market, with imports required. Due to this, domestic companies like Barez Industrial Group (Kerman), Yazd Tire and Iran Tire have identified development programmes for offsetting this deficiency and are in the midst of implementing these programmes. Iran’s automotive sector is also focused on enhancing the quality of cars and optimising weight reduction, enhancing the safety, reducing the manufacturing costs and reducing energy. The country also complies with standards for bus tyres, bias truck tyres and bias wagon tyres. The first standard pertaining to the properties and methods of testing was implemented in 1974. It was revised and is now stated as a Standard No 2169/1. The standard denotes international references such as TRA, JIS, ISO, FMVSS, ETRTO, ECE, meaning to say that Iran’s tyre industry is not far behind other developed countries. Meanwhile, it is predicted that the number of cars in Iran will total more than 30 million by the end of 2021. Thus, with the growth of the automobile industry, increasing affluence of the population and import of various cars into the country, the demand for tyres is expected to increase. Conclusion ran has a huge potential for growth in its tyre market and is an attractive prospect for joint ventures to set up facilities due to: •	Lack of investments in the tyre industry •	Vastness of the country •	Reliance on road transport as the main transportation system •	An educated young population •	Relatively low costs for establishing production facilities •	Proximity to other markets in the Middle East It is forecast that automobile production will reach 11.6 million vehicles/year, with 1 million vehicles/year to be imported – this volume of growth will surely require tyres and is a ripe market for further growth, compared to the saturated market in developed countries.